As we close out the last issue of the Coffee and Tea Newsletter for the year, we like to go back and review past issues to discover which stories generated the most interest, were clicked on most often, and generated the most feedback. Below you will find reprints of our most popular stories of 2012. We want to take this time to thank all of our readers, advertisers, and supporters for helping to make this year a great one. If you have product you would like us to consider for review or have some exciting news to share, please contact us. Honest Tea® earlier this month announced a new, national recycling initiative called “The Great Recycle,” which will launch in New York City’s Times Square on Monday, April 30th. In a show of support for New York City’s pledge to double recycle efforts by 2017, Honest Tea and partners GrowNYC, Recyclebank, Coca-Cola Live Positively, Global Inheritance and Five-Boro Green Services will place a 30-foot tall recycling bin in Times Square and attempt to crowd-source recycle more than 45,000 plastic, glass and aluminum beverage containers in ten hours. The plastic bottles collected will be recycled into essential gardening supplies including shovels, watering cans and plastic lumber, which will be used to build and cultivate an urban garden for PS 102, an elementary school in Harlem. At the event in Times Square, bottles will act as currency. People who bring bottles down to “The Great Recycle” will be awarded points for each bottle recycled, that can be redeemed at the onsite TRASHed Recycling Store run by Global Inheritance. There, points can be redeemed for rewards such as cold bottles of Honest Tea, t-shirts and reusable bags, jeans, video games, and tickets to spo rting events, concerts and Broadway shows. Those who cannot attend the event in Times Square will have an opportunity to participate in “The Great Recycle” by logging onto www.TheGreatRecycle.com and making a recycling pledge and then solidifying it by recycling an old Facebook post. By taking the pledge, users will be rewarded with Recyclebank points which can be redeemed for discounts and deals from more than 3,000 local and national businesses in categories ranging from food and beverage to health and beauty, restaurants, entertainment, sports and recreation, apparel, automotive, electronics and more. 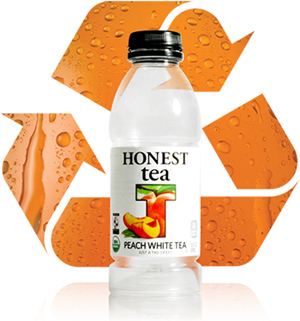 Honest Tea partnered with TerraCycle in 2007 to create the Drink Pouch Brigade, a program which recycles drink pouches and ‘upcycles’ them into items such as pencil cases, book bags, and notebooks. Since 2007, nearly one million Honest Kids pouches have been diverted from landfills. The Drink Pouch Brigades now divert more drink pouches from the waste stream than Honest Tea produces each year. 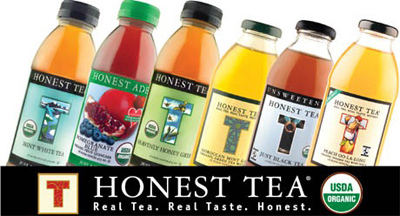 In 2008, Honest Tea partnered with Bethesda Green and The Coca-Cola Company to install 33 recycling bins throughout downtown Bethesda. Within the first year the bins collected more than 4,000 lbs. of recyclable beverage containers. Click here to Watch The Great Recycle Video. In 1997 founder, Bipin Patel, introduced Tipu’s Chai at the small Indian restaurant he owned in Missoula, MT. It soon became so popular that Bipin began bottling a concentrate in order to give other businesses the opportunity to s erve his delicious chai in their restaurants and coffee shops. In 2007, Bipin got out of the restaurant business to focus on his special chai recipe. By 2009, he was able to change facilities and make the concentrate Certified Organic and Kosher, as well as expanding their bottling to include decaffeinated and retail quart bottles. In 2010, Patel introduced Microground Instant Black Chai, a water soluable blend of tea and spices that allowed them to reduce their carbon footprint by not shipping water and it caught on very well. 2011 saw Tipu’s Chai move to Polson, MT with new offices, a br and new production room and the consolidation of all of their production. Package redesigns and Organic and Kosher certification followed, and it was the newest product, Tipu’s Chai Now that was causing all the excitement. This is a complete instant product, just add water for a creamy Soy Chai Latte. Bipin’s family recipe has taken him a long way from the days of making chai from scratch every day in the restaurant. Our staff of picky coffee and tea drinkers loved this new product, “gathering around the conference room table, everyone drinking a cup, you would swear you were in an Indian restaurant. The smell and taste is amazing.” Look for Tipu’s Chai on a shelf at your local grocery or specialty food store. You can also order online at http://www.tipuschai.com. The Abyssinian Fund is committed to reducing poverty in Ethiopia, where coffee farmers make less than $500 per year. Most farmers don’t have access to the training and equipment necessary to grow great quality coffee. The Abyssinian Fund partners with farming communities supplying training and equipment that allows them to produce some of the w orld’s best coffee. Their first coffee farming community is Chaffee Jenette, made up of over 700 male and female farmers and 3,000 other local residents. Chaffee Jenete has been growing coffee for over 200 years! Tadesse Meskela, who is in charge of the distribution for all of Chaffee Jenette's coffee, released $95,500 to the coffee farming community for their coffee purchase and crucial road construction. President of The Abyssinian Fund and Minister at Abyssinian Baptist Church, Reverend Nicholas Richards along with Abyssinian Fund staff in Ethiopia, held several meetings with Meskela encouraging him to provide $41,000 for the completion of the road leading from the village area. The agreement by Mr. Meskela to finance these projects is an innovative and important step forward in aiding the farming communities and general public in Ethiopia. The dangerous, rocky terrain makes it difficult for villagers to reach the nearest city center, Deder, where the health clinic and central marketplace are located, 14 miles away. The road construction is the main priority for the village communities who understand that this funding will help save lives and money. Farmers rely on four-wheel drive trucks for trips to Deder and normally pay a high premium for this transportation. The Abyssinian Fund has been heavily advocating for the road construction project, negotiating with Meskela to provide funding. Paved roads will help cut-down on the amount of deaths that occur due to lack of transportation to the health clinic; patients are usually carried on a stretcher the 14 miles and often die en route. The road is also crucial for transporting goods, especially coffee outside the village where farmers make a higher profit. The Abyssinian Fund provides training and modern tools to coffee farmers in rural Chaffee Jenette. Through training, coffee farmers increase the quality of the coffee they harvest, gain access to buyers who will pay premium prices and then invest 10% of their profit into clean water, health and education projects. This is a sustainable method for enhancing their quality of life and reducing poverty in Ethiopia. UK based INO has created a world exclusive – a unique instant coffee that incorporates organic fruit combined with coffee beans. They have fused these ingredients together in a new process they call Superfangled™ to create World’s first Fruit Coffee and a new sub-category in coffee. It contains 100% natural ingredients and has no artificial flavoring and the range so far includes, Apple Coffee, Strawberry Coffee and Pineapple Coffee. “This exciting and groundbreaking product as well as the creation of a new sub-category is set to revolutionize the hot beverage sector”, says Ali Ataei, Co-founder and CEO of INO and creator of the innovative fruit coffee concept. He believes the way coffee is consumed in the UK is about to change dramatically. You can enjoy coffee with a twist, wherever and whenever. It’s new, it’s audacious, it’s a two fingered victory salute and air punch rolled into one. It’s a deliverance from the normal realism of bland tasting coffee. INO can be made with milk & sugar just like normal instant coffee, however it does not leave any lingering coffee breath, which we believe will completely shake up the hot beverage market. According to the company, INO’s Fruit Coffee is smooth and refreshing where regular coffee’s bitter aftertaste is now replaced with a stimulating and inspirational fruit taste. Consequently, INO can even be drunk without the necessity of adding milk or sugar which is also great news for lactose intolerant people or those who are diabetic. Containing just 9.5 calories per serving, our fruit coffee is sugar free, fat free and contains no salt. It is available in the UK as single serve stick packs with a selection of exciting mixes to choose from. These include Apple Coffee, Pineapple Coffee and Strawberry Coffee, which are packed into innovative and convenient packaging. They can be carried either in your shirt pocket or handbag so you will never be without INO. So far, there has been a huge investment into the project which has been painstakingly developed, researched and approved by a number of first class UK agencies. These include the Engine Group (the UK’s leading integrated Marketing communications agency), DCRM (Qualitative research consultancy), HPI (the UK’s largest independent research company) and Nielsen Bases (World’s top authority on volumetric research). INO has exciting plans going forward with the exclusive launch through our INO online store and additional online outlets where their products can be purchased. They are also planning the launch of INO into UK retail stores and supermarkets in October 2012. “UK consumers have witnessed the coffee culture revolution in the coffee shops over the past 15 years and got used to premium quality coffee as a result. In recent times, not only do they want more variety, they also want the same coffee experience with added convenience, whilst enjoying all the same benefits whether in the comfort of the home, office or on the go. Now INO finally has the answer. Our Fruit Coffee has reinvigorated the market thanks to our unbeatable quality, distinctive variety and having the freedom to enjoy your coffee experience at an affordable cost wherever you are,” adds Ataei. As an introduction to the coffee world, INO held a highly successful soft launch at the Caffe Culture exhibition, which took place on the 16th and 17th of May at London’s Olympia Exhibition Centre. “We had a phenomenal response and buzz from coffee shop owners who want to take advantage of this incredible opportunity to serve something new like INO Fruit Coffee in their premises and to sell our funky retail packs at the till to generate extra revenue”, he went on to say, “We are organizing sampling events over the next few months at London’s top shopping malls, public venues and exhibitions across the UK with our unique popup café, where you will be able to sample the exclusive taste of the world’s first Fruit Coffee”. Find out more at www.inoholics.com. In the spirit of Olympic competition, the folks at Capital Teas celebrate tea as a truly universal beverage with their new, limited-edition blend called “Tea of Champions.” They have created this tea by blending ingredients from 5 continents and 18 countries. Tea of Champions brews a complex cup, with a refreshing mint essence. It includes black tea, green tea, white tea, rooibos, and yerba mate in addition to many herbs and fruits. Black Tea, Green Tea, Rooibos, White Tea, Yerba Maté, almond, chamomile, chili peppers, coconut, conflower petals, currants, elderberry, ginseng root, hibiscus, lavender blossoms, mango, marigold blossoms, orange slices, peony petals, peppermint, pineapple, roasted rice, rose petals, rosehip, safflower, strawberry pieces, tangerine, natural flavors. Countries represented: Argentina, Canada, China, Egypt, France, Germany, India, Italy, Japan, Kenya, South Africa, South Korea, Spain, Sri Lanka, Sudan, Thailand, United Kingdom, and the United States of America. Hot Tea: use 1 tsp. of tea per 6 ounces of water. Heat water to 195 °F and steep for 4 minutes. If bolder flavor is desired, increase the amount of tea used. Iced Tea: use 2 tsp. of tea per 6 ounces of water. Heat water to 195 °F and steep for 4 minutes. After steeping, pour brewed tea over an equal amount of ice. It was in 1992 that chef Sheila G. Mains, better known in the food business as Sheila G, took a treasured family recipe for fudge brownies and baked her way int o a thriving business. You may even have tasted one of her rich, dense squares of heaven at some of our nation’s finest restaurants andthemeparks. So, where exactly did the inspiration for her scrumptious new snack brownie brittle come from? Like many brownie aficionados, Sheila is particularly fond of the crispy edges. In fact, on many afternoons she would walk through the bakery gathering the brittle batter off the sides of the sheet pans as the brownies cooled in their racks. It had that same rich chocolate taste as the fudgy brownies, but with an amazing crunch. That started her wondering about how could she create a whole pan of crunchy edges? Well, lucky for all of us, she figured it out! When we received some samples here at the newsletter, the “test kitchen” began to swarm with staff chocoholics who quickly exclaimed delight in these deliciously crunch sweet treats. And we are not alone in our love for Sheila G’s Brownie Brittle. These flavorful crunchy delights have been favorably reviewed in newspapers and magazines across the country. Brownie Brittle was also the National Confectioner’s Association’s 2012 “Most Innovative Products” award finalist, and winner of the Best Cookie Award at the 2011 Festival of Chocolate. Brownie Brittle is all-natural, kosher, and a dream for those with worrisome peanut-allergies. Also important to note: an entire stack of Sheila G’s famous Brownie Brittle is 120 calories and 3 grams of fat—just about the same as a brownie square. Now you can have your chocolate indulgence without all of the guilt. And what’s better than a helping of Sheila G’s famous Original Brownie Brittle? A heaping, 1-pound mountain of that chocolate goodness—now flying off the shelves at all BJ’s locations nationwide and Costco locations in Texas! Perfect for dinner party desserts, weekend trips, beach days, or a quiet night at home with a cup of coffee or tea, Sheila G’s Brownie Brittle comes in three amazing varieties—we know because we tried them ALL—the best-selling Chocolate Chip, Traditional Walnut, and Toffee Crunch. Sheila G’s Original Brownie Brittle launched on store shelves in April of 2011 and is now available in over 5,000 stores in the US, Canada, and Caribbean. For more info or to order online at www.browniebrittle.com. The North American Tea Championship (NATC) named 17 first-place winners in various categories during its Hot Tea evaluation for spring 2012, held July 30- Aug. 1 in Las Vegas, Nevada at the headquarters of World Tea Media, organizer of the event. The Championship is the only independent competition, judged by professional cuppers, to distinguish the highest quality and best tasting teas that are commercially available in the North Am erican marketplace. NATC Cupping Coordinator Mo Sardella, of The G.S. Haly Company, said, "The NATC Hot Tea competition for spring 2012 was a tremendous success, and continued the momentum of previous competitions. As the tea industry continues to grow and evolve, so does the quality and diversity of the teas that find their way to the NATC judges' table." More than 200 teas were entered into the competition, and a team of experienced tea professionals methodically cupped each tea. Judges evaluated every submission via blind and organoleptic analysis, including leaf appearance, flavor, body, color, aroma, clarity, mouth feel and balance. An overall numerical value on a 100-point scale was then calculated based on the ratings of each characteristic, and winning teas were determined by rank. The North American Tea Championship Hot Tea Class is evaluated twice a year, July for spring teas and February for fall teas. "Unlike any other sector in the food and beverage industry, specialty tea offers the greatest diversity in origin, manufacturing styles, tradition and innovation," noted Sardella. "Furthermore, teas and herbs are some of the most subjectively appreciated beverages in the world. As the specialty tea industry continues to grow, it is more vital than ever for NATC to be known as the central source for quality tea evaluation and classification in North America." Notable Improvements & Surprises: "In past NATC evaluations, the Puer category rarely exceeded judges' expectations of quality and variation as the category should reflect," shared Sardella. However, he noted that this year's offerings showed an eclectic range of puer, representing all sub-categories of the type—green and dark, loose leaf and compressed. "It seems evident that the increased demand for puer teas in the West has sparked demand for increased variety and enhanced quality out of Yunnan, China," he said. "This year's Darjeeling entrants also showcased the ever-widening spectrum of creative, non-traditional outturns available to consumers," added Sardella. "And this year's White Tea category was by far the most surprising of the competition. Similar to Darjeeling with regard to boundary-pushing leaf styles, flavors and textures, the White Tea category represented the greatest diversity of manufacturing origins, including China, India, Sri Lanka, Hawaii, Malawi and Nepal. Also noteworthy, the Matcha tea category showed an overall improvement this year, as notably fresher and higher quality ceremonial-grade teas were represented this year than in years before." According to Sardella, a topic discussed by judges at this evaluation—as well as at other NATC competitions—is the balance of tradition and innovation within specialty tea. "More non-traditional tea types and origins are being entered into once traditional categories, challenging the judges to further define tea types," he said. "Judges' interpretations of leaf appearance, flavor and mouth-feel, stirred up healthy discussion about the importance of creating a venue for both tradition and innovation for North American tea consumers. While this topic may be controversial to some, the NATC judges look forward to these discussions as they're much-needed in the tea industry, to understand and appreciate quality for what it is rather than what it is expected to be. Thus, the NATC remains a place where traditional tea standards and innovative non-traditional tea concepts can be judged through a common methodology—all in the pursuit of quality, balance and uniqueness." A complete list of first, second and third-place winners, as well as details on the Championship, is available at www.TeaChampionship.com. The next North American Tea Championship takes place November 2012. Melitta, a brand well-recognized for exceptional quality in all aspects of coffee and coffee preparation, expands its selection of single-serve products with the debut of the Melitta JavaJig™: a reusable, single-serve Melitta filte r system. The completely customizable offering provides coffee lovers an easy, cost-conscious and environmentally sound alternative to prefilled single-serve coffee capsules and further secures Melitta’s position as the worldwide leader in coffee filters. Customizable: The Melitta JavaJig provides unlimited variety and brew strength control. Simply choose a favorite coffee or tea, and then adjust fill levels to taste. The Melitta JavaJig filter system allows for a rich, bold cup of single-serve coffee. Economical: A cup of coffee made using the Melitta JavaJig costs approximately 50 percent less per cup, when compared to using prefilled single-serve coffee capsules. Environmental: The Melitta filter system is reusable, and the paper filters are compostable. The cup is also BPA free. Like Melitta Bentz, the company’s founder who revolutionized the coffee industry in 1908 by inventing the pour-over method of coffee making, the brand today continues to change the world of coffee drinking…one cup at a time. Designed for use in most Keurig, Inc. style single-serve coffee brewers, the Melitta JavaJig is quick and easy to use. “We’re excited to add the Melitta JavaJig to our ever-expanding selection of premium coffee products. With this filter system, we’re offering consumers an easy and environmentally friendly alternative for single-serve brewing – all at a great value,” says Chris Hillman, vice president of marketing at Melitta. The Melitta JavaJig will be available nationwide at major grocery and specialty retailers, beginning October 1, 2012. The JavaJig Starter Pack, which includes two filter cups and 30 Melitta single-serve filters, will retail for $8.99. The refill pack of 60 Melitta single-serve filters, designed specifically for use with the JavaJig, will retail for $3.99. For more information on the Melitta JavaJig, please visit: http://www.youtube.com/watch?v=VkomUzb-YN8&feature=plcp. Bee Raw is causing a buzz, bringing the most diverse assortment of raw, unadulterated, varietal honey to the marketplace. To celebrate and support America’s rich beekeeping heritage, Bee Raw partners with family-owned apiaries around the country and derives each varietal from a single local floral source to achieve a distinct flavor, color and aroma. The company’s assortment of innovative honey flights, classic honey jars, and honey gift assortments can be purchased at www.beeraw.com, with a brand-new line of estate-grown loose teas joining its enticing offerings. The essence of Bee Raw honey is in its simplicity. By skipping the processing phase, their honey retains its bold flavor, distinct color and natural goodness, as well as the pollen that possesses immune-building properties. Each Bee Raw varietal honey is “fairly traded,” meaning the local beekeepers that produce them receive a premium price for their premium product. Bee Raw also strives to be socially and environmentally sustainable by employing local manual laborers and using postconsumer paper and glass packaging. Blueberry Honey, Maine—A rich, visually striking, and sturdy, medium amber honey. Strong and sweet, with earthy components and a playful, buttery-sweet note. Perfect for pairing with Stilton, melons, and crème fraiche. Buckwheat Honey, Washington State—A stout, complex honey comparable to sorghum or molasses. Hints of mossy earth and a not-so-sweet composition combine to develop a malty flavor with a pronounced bright finish. Great with fresh goat cheese, broiled grapefruit and Greek yogurt. Orange Blossom Honey, Florida—Enticing and surprising, with notes of citrus and tangy rind are playfully intertwined in a not-too-sweet, captivating finish. Excellent with Manchego, aged sheep cheeses and lemons. Sweet Yellow Clover Honey, Colorado—Yellow Melilot flower adds a wonderful aroma to this honey, which also boasts an initially delicate, sweet and buttery taste, followed by warm undertones of cinnamon and nutmeg. A great partner for Chèvre, figs and iced chai tea. Wild Black Sage Honey, California—Sage gets its name from the Latin salvia (meaning "to heal"). This honey is mild with a mouth-warming hint of pepper and a smooth, clean finish. Pair with Parmigiano Reggiano, wine-poached pears or goat cheese ice cream. Wild Raspberry Honey, Maine—Light yellow in color and floral with a unique raspberry finish intertwined with the aroma of warm cocoa butter. Try it with raspberries, peaches, pears or sour cream. Basswood Honey, New York—Light in color, delicate and mild, featuring warm herbal notes and a clean finish. It’s an excellent choice with Fromage Blanc, fresh green apples and vanilla ice cream. Cranberry Honey, North Carolina—Smooth, pungent and mildly tart with a delicate cranberry aroma, complemented by subtle floral hints and a very light fruit finish. Enjoy with Gruyere, tangerines and apples. Sourwood Honey, Colorado—Harvested at the end of the bloom when the nectar is sweetest, this honey is highly floral, rich and buttery with a maple finish. Great with grilled peaches, clotted cream, Camembert and other bloomy rind cheeses. Star Thistle Honey, Colorado—Thick and creamy with soft notes of cinnamon and a long, sweet finish. Perfect for oven-roasted apples, hot apple cider or in a recipe for pan-seared prawns. Chamomile Herbal Tea (Best paired w/ Maine Wild Raspberry Honey)—Soothing, sweet and caffeine-free. Made from organically grown Chamomile with notes of fig and honey. Mt. Olympus Herbal Tea (Best paired w/ California Wild Black Sage Honey)—This national herbal drink of Greece is peppery and delicious. Known for its medicinal benefits to be anti-microbial, anti-inflammatory, and anti-oxidant, it is truly a gift from the gods. Assam Black Tea (Best paired w/ Colorado Star Thistle Honey)— From the Satrupa Estate in northeastern India, this tea boasts round, sweet and malty flavor that’s the full-bodied base of most Irish breakfast blends and is tasty yet traditional. Karigane Kukicha Green Tea (Best paired w/ Colorado Sweet Yellow Clover Honey)— Highly prized, yet virtually unknown in the west, this fulfilling, traditional Japanese “twig tea” is made in the traditional style from Gyokuro green tea stems. White Peony White Tea (Best paired w/Florida Orange Blossom Honey)—This succulent tea from the northern Fujian Province of China has rich fruit blossom aroma. Made from delicate young leaves, it is gently handled from harvest to cup. Bee Raw Honey pricing starts at $12 for single honey jars and goes up to $79 for flights; Bee Raw Tea products range from $14 to $85. Combination honey and tea gift sets are also available within these price ranges. For more information about Bee Raw products, recipes and pairings, please visit: www.beeraw.com. Growing up on his family’s farm in Northwestern Pennsylvania, Zeke Freeman gained an appreciation for homegrown fruits and vegetables and the rich heritage of artisanal food production. As an adult, he turned his passion for preparing food for family and friends into a full-time pursuit of the culinary arts. Today, Freeman solely manages the company, and he has expanded Bee Raw’s distribution, making its single varietal honeys and honey flights available nationwide. He also actively promotes the importance of American family-owned apiaries and works to educate the public about beekeeping and its vital role in agriculture. Freeman is committed to supporting American artisanal beekeepers by ensuring that they receive a premium price for a premium product. EXHIBITOR INFO NOW AVAILABLE. LIMITED SPACE REMAINS. The exhibitor space at the February 2012 NYC show was sold out—don’t miss this opportunity to showcase your product/service. Click here to request exhibitor info & application.